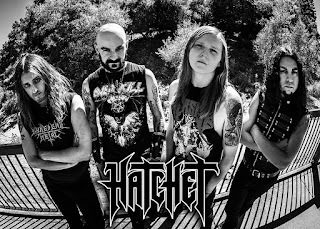 Bay Area Metal staples HATCHET have released the video for "Desire For Oppression", the first single from their new album "DYING TO EXIST" in stores June 22, 2018 via COMBAT RECORDS/EMP LABEL GROUP. "Desire For Oppression" is also the lead off track on the upcoming 2 disc "COMBAT BULLETS VOL 1.0" compilation, in stores April 6th 2018, also featuring tracks from COMBAT artists including SWORD (CANADA) , HELSTAR, DEAD BY WEDNESDAY, MARC RIZZO, WRATH, GREEN DEATH (FEATURING DAVID ELLEFSON), and THROW THE GOAT, plus over 25 of the best underground metal bands, as voted by fans, including CASKET ROBBERY, THE VENTING MACHINE, WHITE THRASH, ANIALATOR TX, JUDGEMENTAL, MIDNITE HELLION, AT HOME IN HELL, MYNAS, DIABOLOGY, A HANGING, FATAL MALADY, and more. 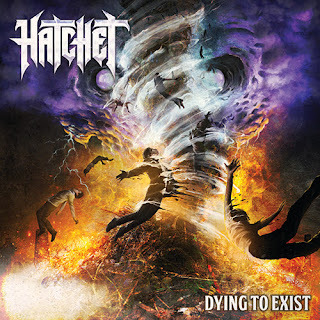 HATCHET has launched the pre-order, for "DYING TO EXIST" via combatmerch.com, available on CD and LP, and in several bundle configurations. The video is available at the following location: https://youtu.be/Pic7fpt8_SU.